This month’s second recommended spooky read isn’t all that spooky, but it is hilarious times four. Yes, this series just had the release of the fourth book, ZILLIONS OF ZOMBIES. I’ve got a review of all four books and if you scroll to the bottom of this post, you’ll find details how to enter and possibly win a great giveaway of the entire series. If you are in need of a laugh, you’ll find it jumping out at you on many of the pages. Having a bad day? Read a chapter and you’ll feel better. Silly is something we all need a larger dose of once in a while. 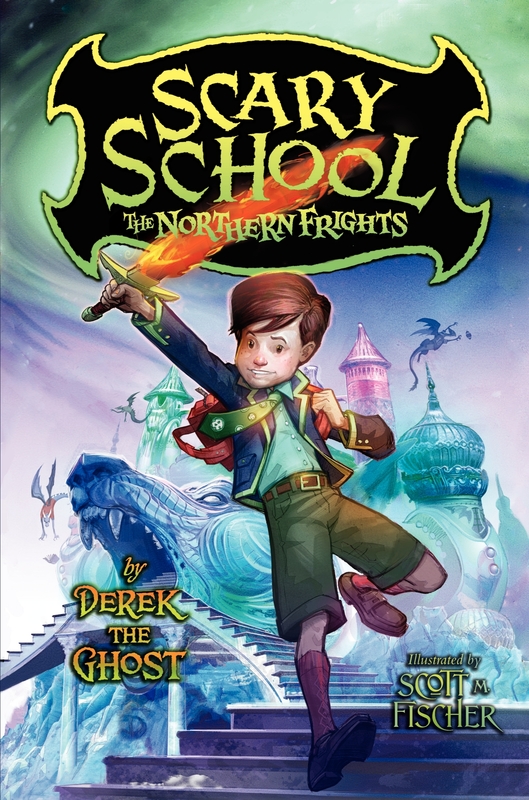 Derek the Ghost is an entertaining story teller, or as he is described – a ghost writer. You forget he’s a ghost with his humorous take on the daily events at Scary School. Derek’s story is also covered, but you’ll have to read all four to get the full story. A big WOW to Scott Fischer’s brilliant illustrations in the first three books and Revo Yanson in Book #4. I’d decorate a kid’s room with many of their funny depictions. From the lunchroom to the classroom to the playground, the craziness of this place shines. Not only do you get inside Scary School but be prepared to head off to other mysterious places. So many inventive and creative happenings thanks to the author. The first book has a loose plot that serves to introduce readers to the students and staff of Scary School… and what a cast of characters! Charles Nukid (He’s called new kid only because he is the new kid), Nurse Hairymoles, Frank (pronounced Rachel), Principal Headcrusher, and Dr. Dragonbreath to name a few. There are frequent deaths but the dearly departed are usually brought back in various ways. Skillfully narrated by Derek the Ghost, the accompanying well drawn pictures are a fun reminder of the characters. The images, scattered across the chapters, often get full page treatment. The story covers year one at Scary School that culminates with The Ghoulish Games.This story would make a great read aloud before lights out or in the classroom. It’s also a good choice for the reluctant reader in your life. FAVORITE LINES: As you will see, there’s all sorts of ways a kid can come back from the dead and keep attending classes. In fact, losing your life is never an excuse for missing class. Plus through the act of dying, a dead student will ironically learn an important life lesson. 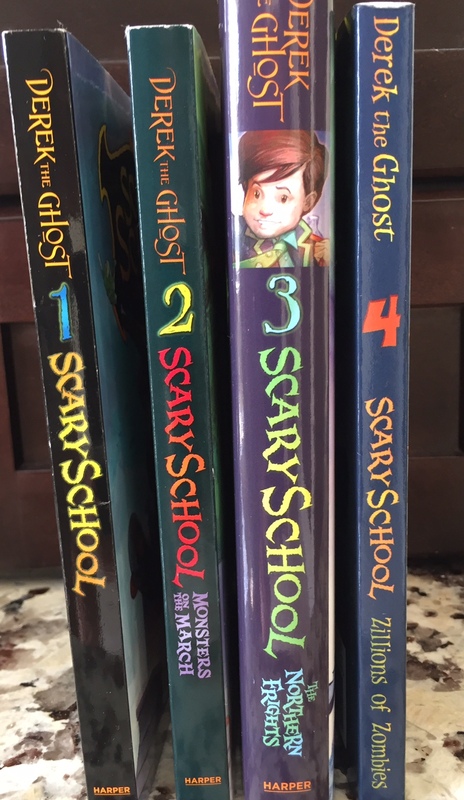 It is such life lessons that will make Scary School probably the most wholesome book series to be published in the last twenty years. 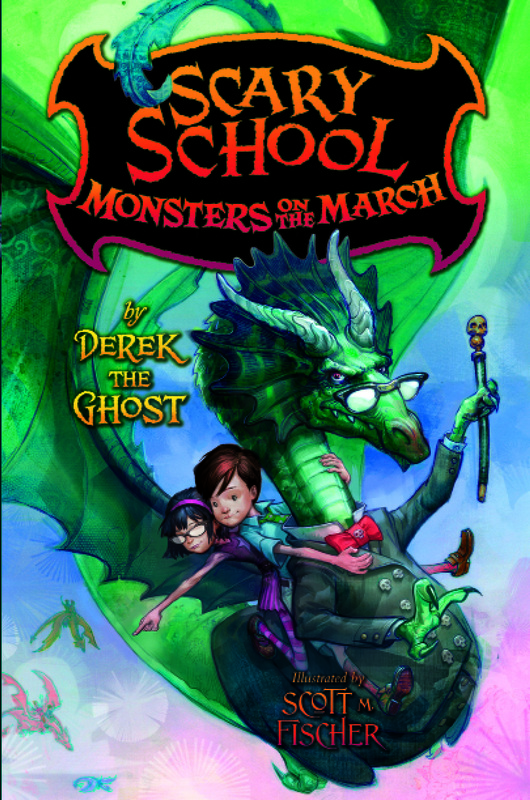 Derek the Ghost continues his humorous narration in book #2 covering the first semester of sixth grade. Back are students Charles Nukid, Penelope Possum, and an entire class who spent the three-month summer vacation trapped in a haunted house. New characters are also introduced in the form of Mr. Grump, the elephant man teacher; and Ms. Hydra, a rather scary hall monitor with seven heads. The more plot driven sequel has the students of Scary School on a trip to the Monster Forest. They won this opportunity by their expert play in the Ghoulish games from Book #1. They meet a variety of fearsome monsters including King Zog whose daughter, Princess Zogette, follows her new love (Charles Nukid) back to Scary School. War then erupts between the monsters. With this fantasy filled setting, laughs at every turn (some only adults will get), and more wild and spooky adventures, this second installment will grip even the most reluctant readers. FAVORITE LINES: The mummy walked to the chalkboard and drew several pictures. He drew a circle, a bird, a snake, then another bird. The kids and staff of Scary School are back from Winter break in this third book. Lattie, a girl ninja, is a new character introduced. What she does to intercept a spit wad is simply amazing. She along with Charles Nukid and four other students are chosen to attend Scream Academy, the scariest of all schools. Principal Headcrusher is the only human to ever survive this place and it’s not looking as promising for this group. It will be humans against monsters (Like ogres, trolls, and yettis), and the Scary School students will need to work together to come out on top. An epic showdown with an ice dragon will determine their fate. This installment is a bit more serious but will still keep the attention of readers with unique characters and a surprising finish. Mr. Grump handed Petunia the piece of paper. Petunia responded, “It’s a note from Principal Headcrusher. It says , Dear Mr. Grump. It has come to my attention that you know absolutely nothing and are therefore not qualified to be a teacher at this school. However, you are welcome to join your class as a student. As soon as you know something instead of nothing, I will consider rehiring you. Yours truly, Principal Meredith Headcrusher. 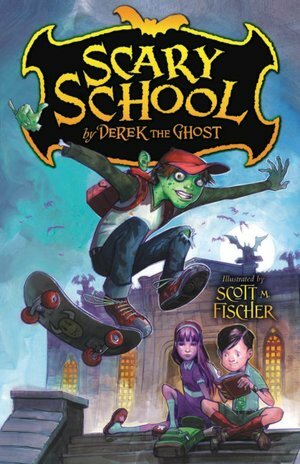 The final book in the Scary School saga is a fun, exciting, zombie filled conclusion to this kid loving series. The tension is ramped up, but not at the expense of the humor in every chapter. I found myself giggling and several times full out laughter escaped. It was hard not to with the crazy events as described by Derek the Ghost. This plot is the most tension filled of the four with Charles Nukid becoming King of the monsters (AKA King Toothpick) while zombies are creating havoc both in Monster Kingdom and back at Scary School. Derek has a lot to cover as he describes the scary proceedings at each location. It takes courage and some rather unusual new characters to bring readers to THE END. My favorites were the bog monster, Chunky the doll, and the worst unicorn magician one could imagine. Despite the zillions of zombies, (don’t worry… nothing too gruesome to keep the middle grade crowd from sleeping), themes of friendship, accepting differences, and working together ring true. There’s even a bonus chapter that shows what happens 29 years after this story. The series successfully wraps up every plot point and will live on to entertain many new fans. That also means I have a great source for the 8-11 year-old reluctant reader. How can they resist? 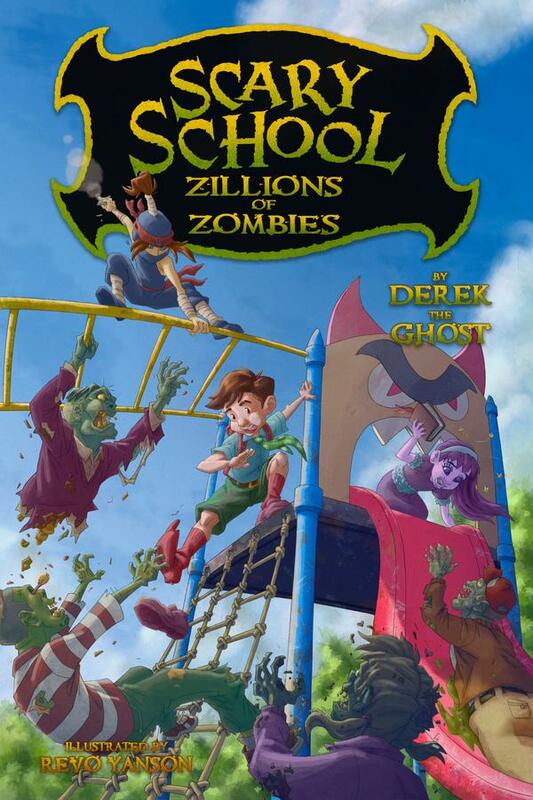 To mark the recent release of SCARY SCHOOL #4: ZILLIONS OF ZOMBIES, I’m celebrating with a giveaway of all four books in the series (One hardcover and three paperbacks courtesy of the author). Just mention your favorite Halloween costume worn by you or a trick or treater in the comments and you’re in the drawing. One lucky winner will be drawn next Sunday evening (10/18/15) at 7 p.m. EDT so get your entry posted by then. 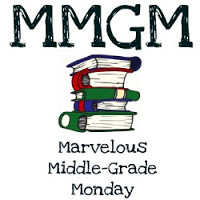 This entry was posted in Reviews and tagged Derek Taylor Kent, Derek the Ghost, Marvelous Middle Grade Monday, MG book reviews, Middle grade, Scary School Series. Bookmark the permalink. Love the sound of these, Greg. The covers are brilliant too. Pinned and shared and TBRd. I’ll have to remember these when I need a laugh. I’m going to let someone else win these. My TBR stack is pretty high right now. These sound like something my kids would love! They are so into Halloween, and funny is always good. I’ll have to see if our school library has them as well. As for a costume, I rather liked my kids’ Luke and Padme duo last year. I like pirate outfits on boys and princesses on girls. Thanks for the opportunity to win. “I couldn’t find a marker.” Ha! That cracked me up. I will have to get these books for my granddaughter. They are right up her silly alley. Please let someone else win. I have soooooo many books to read right night, but I will definitely get to these. Thanks for the review. My son would love this series. I think he may have read the first book at school. His costume is a ninja this year. My favorite kid costume are ones that make me laugh. For myself it’s usually an orange shirt! I have a reluctant reader 10 year old son who I’m going to try this series on. 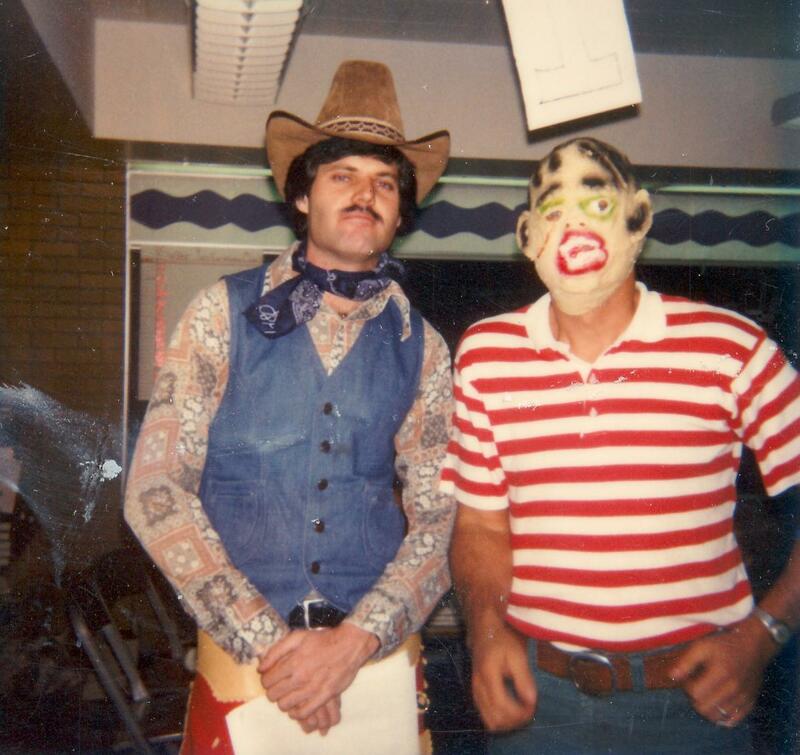 My favorite costume was a clown outfit, including a hat that my mom made for me when I was 16. As a kid, the costumes were always made from whatever we could find. I have never had a store bought costume. Never felt deprived because of it. As far as I can remember, my all time favorite halloween costume when I was still a kid was a fairy! And of course, the wings should be wonderfully made! Great sounding series. My kids always want the zombie look.